Golf tools in zippered pouch with 40mm carabiner clip. 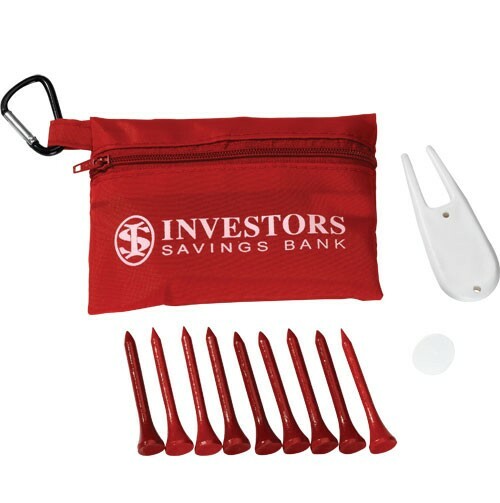 Includes: 9 biodegradable golf tees, 1 ball marker & 1 divot tool. Bag: Silkscreen (One color only) Set-up charge $50(V). Re-order set-up charge $30(V). Tee: Pad Print (One color only) Set-up charge $50(V); Re-order set-up charge $30(V). Ball Marker: Pad Print (One color only Set-up charge $50(V); Re-order set-up charge $30(V). Divot Tool: Pad Print (One color only) Set-up charge $50(V); Re-order set-up charge $30(V). For contents to be customized, minimum quantity 500 pieces.